Stephenie Meyer-This is particularly likely if a bunch of teenage girls saw the poll (incidentally, I actually do think there's a case to be made that Meyer is the most influential author of the last decade). EL James-I would seriously laff my arse off if she won this poll. The fact that she's not American would just make it more perfect. James Patterson-I've heard this guy is pretty popular. A bunch of authors saw the poll and voted for themselves-I'm looking at you, Jeffrey Eugenides. Ha! Just kidding. Stephen King-King has that rare combo of popular appeal AND critical rep. I would not be at all shocked if he got in a lot of votes. Dan Brown-Kind of outdated as the author du jour, but you never know, he could still get some votes in. Nora Roberts-Admittedly not very likely, since romance readers tend to avoid polls like this (I speak as someone who reads romance), but she definitely deserves some write-in votes. I mean, the woman has her own section in the bookstore. Who did you vote for in the poll? 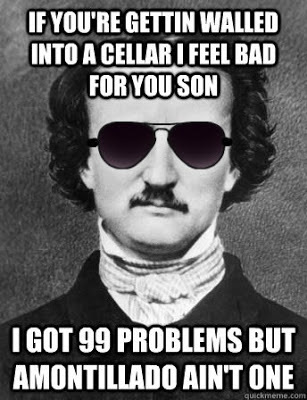 Edgar Allan Poe, right?